Gripsweat - Dolly Parton - Jolene LP 1974 RCA UK 1st press! (-1E/-1E) Vinyl Near Mint! Earliest UK 1st press in superb condition! Vinyl looks and plays like new! PRESSING DETAILS: RCA Victor AFL1-0473 UK 1st Press with (-1E/-1E) matrix endings. 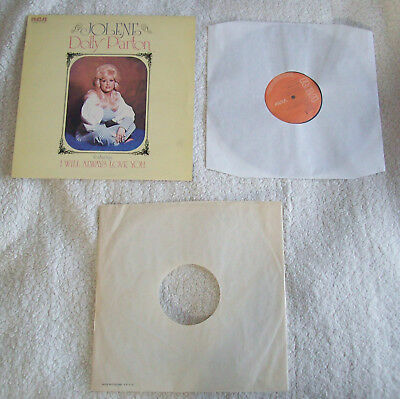 SLEEVE: (VG) Original UK 1st press sleeve with very light wear and a some staining in places. A surface scuff to the spine with some lifting but all the text is still there (see pictures). No splits. No writing. INNER SLEEVE: (VG-) Original inner with has light wear and staining with album details written in felt tip pen. No Splits. RECORD LABELS: (NEAR MINT) Clean labels with no writing and no stickers. VINYL CONDITION VISUALLY: (NEAR MINT) Vinyl it flat and glossy with very isolated light paper scuffs and hairlines only visible when angled under bright light. OVERALL PLAYING GRADE: (MINT) Plays like new! There are no pops, no clicks and no crackle! The sound quality is amazing - far superior to any CD remaster or re-press with real warmth and detail. A rare record in stunning condition! Very hard to find like this! Strict grading using Record Collector grading system. All records are sent in correct record mailers or cruciform box with cardboard stiffeners and the vinyl removed for the the original inner and put in a new polylined inner sleeve outside of the cover to make sure no splits happen during delivery. All vinyl is sent tracked and signed for.